If you have a penchant for wartime sagas you’ll enjoy At Long Last Love, Milly Adams’s latest novel. Adams excels at creating characters you really care about and Kate Watson is no exception. The novel starts in July 1942, when feisty nightclub singer Kate is scratching a living in bomb-blitzed London. I was enthralled by the juxtaposition of Kate’s rackety London life and her demanding work as an air raid warden (she keeps her uniform and tin hat at the ready in her dressing room). But the book really gets into its stride when Kate agrees to return home to Dorset for a month to look after Lizzy, the niece she barely knows. Little by little, as Kate has to deal with the prejudice and disapproval of the local community, we learn the secrets of her tragic past, her estrangement from her domineering father and the truth about Lizzy’s conception. Kate is a fascinating character but there are lots of other memorable individuals in the book. 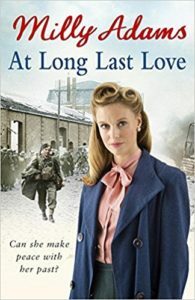 There’s Kate’s sister Sarah, seemingly unsympathetic at first, who has left sleepy Dorset to become a spy in war-torn France, ten-year-old Lizzy, who has a sweet nature and the voice of an angel, and the new vicar, who was horrendously injured at Dunkirk (and whom Adams admits is based on Grantchester star James Norton). The book is packed with fascinating period detail and even though the story is sad in parts it’s full of hope and love too. My only quibble? Surely Darby and Joan isn’t spelled Derby and Joan?